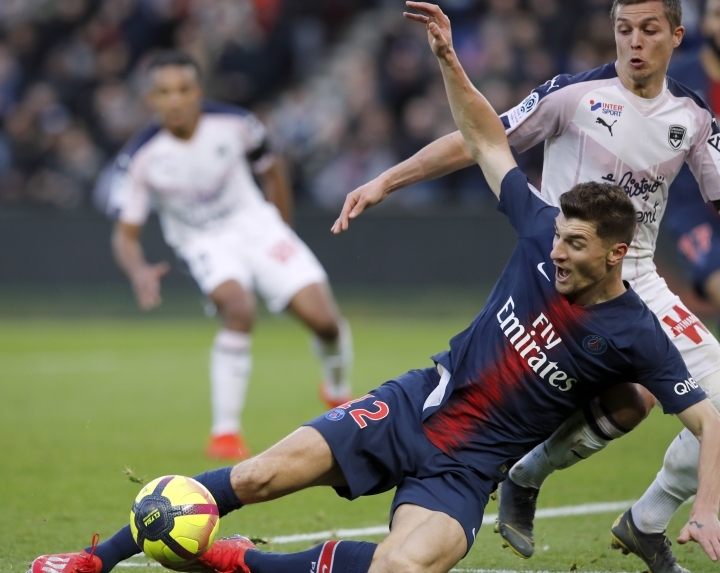 PARIS — Lille stepped up its bid for second place in the French league and automatic qualification for the Champions League by winning 2-0 at Guingamp before Lyon lost 1-0 at Nice on Sunday. The northern France side remains 10 points behind runaway leader Paris Saint-Germain, having played two games more than PSG. Lyon is six points ahead of fourth-placed Montpellier, which has played one game less. Finishing third ensures a place in the Champions League qualifying rounds. Montpellier is fourth on goal difference ahead of Saint-Etienne, which lost 3-0 at Rennes. Striker M'Baye Niang, winger Hatem Ben Arfa and midfielder Adrien Hunou got the goals for eighth-placed Rennes. On a day of mourning for Emiliano Sala , Nantes players walked onto the field dressed in black with Sala's name on their backs as the crowd chanted his name. A minute's applause was observed at all stadiums in the top two divisions in France this weekend, in memory of the Argentine striker who was killed in a plane crash at the age of 28. Also, Toulouse drew 1-1 at home to Reims. Striker Edinson Cavani sustained a hip injury as PSG beat Bordeaux 1-0 at home on Saturday, ruling him out of Tuesday's match at Manchester United in the last 16 of the Champions League.